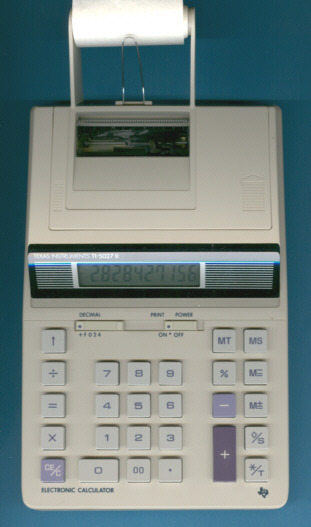 The TI-5027 II replaced the almost identical TI-5027 within one year and features a much larger display. The calculator is still battery operated. The label on the backside of the TI-5027 II looks familiar to us, the leading "T" of the date code suggests Toshiba as manufacturer. Dismantling the calculator reveals its true genes, it was indeed developed and manufactured by Toshiba in Japan. Please notice the Toshiba printed on the printed circuit board (PCB) of the calculator. © Joerg Woerner, April 5, 2008. No reprints without written permission.